I’m presenting on Thursday to the Columbus SQL Server Users Group, home of the newly minted MVP, Jeremiah Peschka (congrats again). It’s to be a virtual presentation through live meeting. The topic is a Understanding Execution Plans. This time I hope that one of us remembers to hit the record button unlike last time when I did this presentation for the PASS AppDev Virtual Chapter. If you’re in the area, come on down and meet me, virtually. Show runs from 6:30-8:30, although all that time is not my presentation, so I suspect Jeremiah has some more fun planned. I don’t generally do lots of blog aggregation and cross post linking & stuff. It’s just not something I’m that into. However, this time is an exception. Gail Shaw, Gila Monster to those who hang on out SQL Server Central, has posted an excellent explanation of times when Estimated and Actual row counts vary for a reason. I’m one of those who emphasises that differences between estimated & actual is an indication of… something. It could be out of date or missing statistics or it could be caused by query language like multi-statement table valued functions, but it’s usually and indication of a problem. Except when it’s not. Read Gail’s explanation for more. 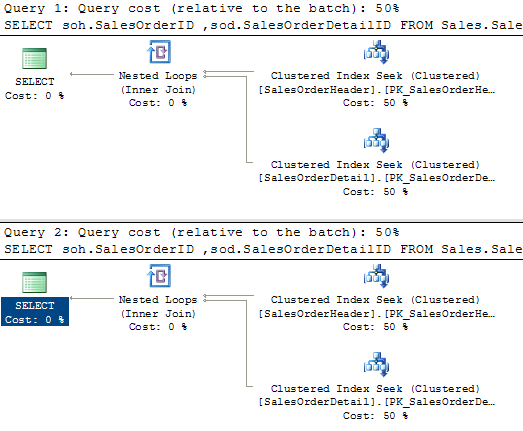 You could be looking at an execution plan on a query and see this message: Warning, No Join Predicate. With a very few exceptions (very few), that’s not a warning, like “Mind the gap” or “Your Mileage May Vary” or “Never fight a land war in Asia.” No. It’s a screaming shout saying “BY ALL THE GODS IN VALHALA, YOU DON’T HAVE ANY JOIN PREDICATES IN THIS QUERY!” Seriously, that’s exactly what it says. But, you might be asking yourself, that’s what it says, but what does it mean? Please allow me to explain. The tables in your system, whether it’s a classic BI star schema, or a highly normalized OLTP system, or even (shudder) ORM objects, are related to one another. Usually they’re related through the use of primary and foreign keys. The primary key uniquely identifies a row, like a particular value in a dimension table. This then is related to some number of rows in another table, like in a fact table, through the foreign key. The foreign key acts to protect the integrity of the data, ensuring that if you insert something that’s supposed to relate to another row, then that other row really exists and if you try to delete that other row, the foreign key will remind you that, hey, that row has things that depend on it existing in another table. All of this can be quite complicated or quite simple. Heck, you may be using an ORM system and don’t have a single foreign key in site. What you have there is an inner join, or in the old parlance, an equi-join because of the use of the equals sign, between TableA and TableB and an left outer join, defined through the use of the ‘*’, between TableB and TableC. Any other criteria that defined the WHERE clause then followed. This forces you to separate the relations between the tables as defined by the JOIN’s and the filtering methods supplied through the WHERE clause. And yes, it’s a lot more complicated than I’m making it out to be, but I’m trying to establish the ground rules here. Where was I? Oh yeah, missing join criteria. I would never consider “No Join Predicate” as a warning. It’s a blaring klaxon of a problem and you need to do something about it, right away. I got the question the other day, when are you likely to see a spool in an execution plan? Easy, whenever SQL Server needs to walk through the data multiple times, usually in JOIN operations… Yeah, well, once again, my flip answers are not quite the entire story. Spool operations are temporary storage of the data for later reuse in a query plan. There are two types of spool operations, eager spool and lazy spool. A spool is basically a temporary table created within the execution of the query that is used when it’s likely that data will be needed again, and again during the execution of the query. This is not an explicit #temp temporary table, but a work table for operations within the processing necessary for a given query’s behavior. A spool is created when the optimizer thinks that it can work better with a semi-permanent sub-set of data rather than have to perform multiple seeks or scans against a table or index or in other places where data re-use is important (more in a bit). In this case, an eager spool is used as part of the roll back mechanism and to prevent the Halloween scenario. An eager spool is one where the data is retrieved immediately. Now you see a table spool that is called a lazy spool. This means that it only loads data as the data is requested. This makes a lot of sense because the lazy spool is operating as the means for gathering the recursive data together. So it’s not going to go and get all the data available, like an eager spool. Instead it’s going to only load the data as needed, lazy. These two scenarios are much more likely than the typical join to show a table spool. Yes, it can, and does, appear in join operations, but as I said at the beginning, that’s such a flip answer. Much better to try to be complete. Recently I’ve been seeing a lot of people with bad execution plans, desperately trying to tune them, but they were unable to explain why they had such bad plans. More often than no these were larger queries, with a number of derived tables, CTE’s, CROSS APPLY, etc. In most cases the statistics appeared to be fine (this is usually checked by comparing estimated & actual rows within the operations in the execution plan) and the plans themselves didn’t look crazy, but the execution plans were flat out, not good. You can also find this right in the XML for the execution plan. In the Batch/Statements/StmtSimple property find the @StatementOptmEarlyAbortReason. It will show the same thing, “Time Out,” when the optimizer has run out of time. You can get other early abort reasons, but the best one is “GoodEnoughPlanFound.” That means that the optimizer was able to complete it’s job. That doesn’t mean you have a good plan, but it means that you don’t have some interim pile of junk that is doing you more harm than good. What can you do to fix this? Write simpler queries. OK. Maybe that’s not helpful. Try to simplify the query. You may not be able to. If not, you might try rearranging the query, changing the join order. Yes, as everyone says, join order doesn’t matter, but the full statement is “Join order doesn’t normally matter.” Sometimes it can make a real difference. You may also have to supply some query hints, join hints, etc., to try to nudge the optimizer along. I keep thinking I’ve got a handle on the way execution plans are dealt with in SQL Server. I had a pretty simplistic view of things, there’s the estimated plan which comes out of the optimizer and there’s the actual plan which comes out of the data engine. The one shows the best guess for what will happen based on the query and the underlying statistics. The other shows what actually happened based on the query and the real data, load on the server, available memory, you get the idea. This model is easy to explain and understand. Too bad it’s not quite the way things work. You can see the estimated plan for executing this batch. 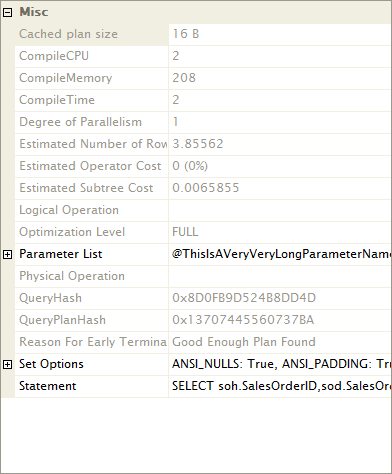 So… if the optimizer creates estimated plans, but it can’t create an estimated plan for this query since the algebrizer can’t resolve the object name… where did this estimated plan come from? Good question. Here’s some more interesting info. 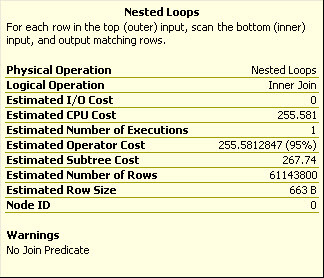 You know that you can capture both estimated & actual execution plans through trace events, right? Watch what happens if you run the batch statement above and capture both the “Showplan XML” and “Showplan XML Statistics Profile” events, estimated and actual, respectively. 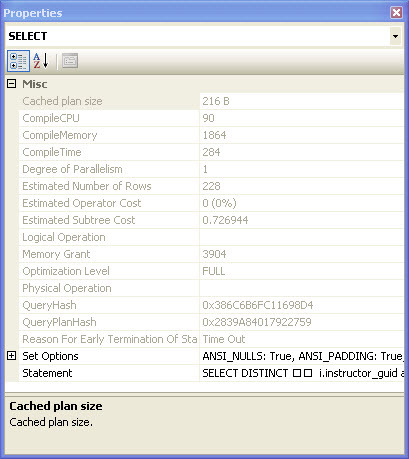 You’ll get the estimated plan that is being stored in sys.dm_exec_query_plan and you’ll get an actual execution plan including actual rows vs. estimated, etc. Where did that execution plan come from? Another good question. A better man than I, Tibor Karaszi, first noticed that there was, other than the execution statistics, no difference between “XML Showplan” and “XML Showplan Statistics Profile.” He asked whether or not we should ever expect to see a difference in a forum post. I jumped in with both feet, of course you’ll see a difference. After all, one is the estimated plan and one is the actual plan. Mr. Karaszi corrected a couple of my assumptions and suddenly, there I was, not understanding execution plans, again. I didn’t know where those estimated plans were coming from, not for sure. I assumed the optimizer, but then how were they getting past the algebrizer? I had a theory and a mechanism for testing it. If I set up a trace and capture the recompile events using SQL:StmtRecompile and return the EventSubClass column, I can see what caused a recompile. When I run this query and check the trace information, I find that the EventSubClass resolves to 3-Deferred Compile. I’m not 100% certain that I’m correct here, but the following is what I think occurrs. 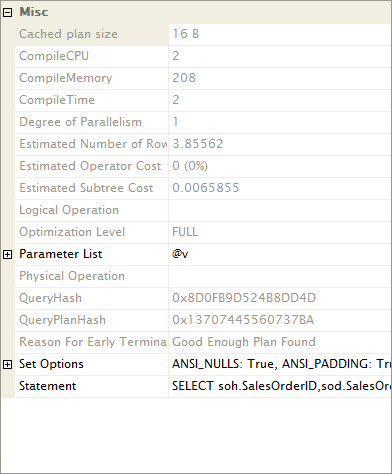 Because of the CREATE statement, the batch is going to fail in the optimizer. But, because it’s a DDL statement, it goes on to execute anyway. Then, a recompile puts the batch back through the optimizer. There, a table is now available where none was previously. An estimated execution plan is created. This plan, previously non-existent gets stored and can be accessed by us. Within the facts available, this seems to explain the behavior. In fact, it’s basically supported by Connor Cunningham, one of the MS SQL Server developers, in some blog posts over at Conner vs. SQL.